Jeju, the southernmost and biggest island of Korea, is a popular summer destination for Koreans and foreigners alike. But even if you don’t have the plane ticket to get there, you don’t have to miss out on the island experience. Granted, Tamla Sikdang does not provide the clear blue waters and lush hiking routes of Jeju Island, but this is a rare place in Seoul where you can encounter pretty authentic Jeju home cooking. Located in a quiet part of Seoul, this modest restaurant with about twenty seats bustles with Seoulites in search of “something different.” All the ingredients as well as the restaurant’s owner come from the island. 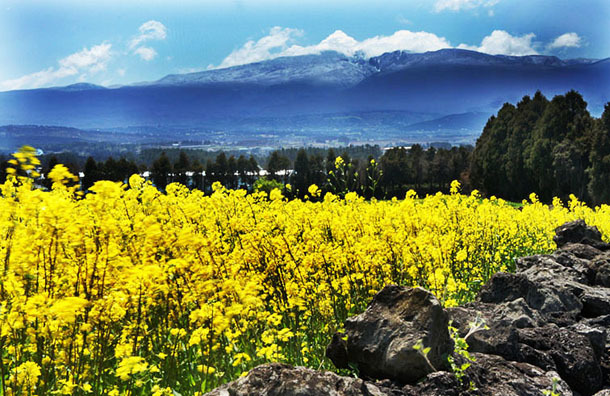 Jeju is famous for its distinct culture and food. Fermenting and strong spices are rarely used because of easy access to fresh ingredients all year round thanks to Jeju’s warm climate. Jeju is also famous for pork. 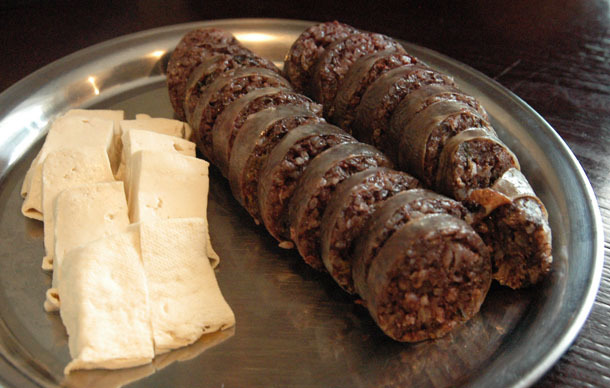 Jeju black pig is a native breed in the island and it’s known for its chewy texture and good taste. It was my friend who introduced me to this place and she ordered dishes I’ve never had in my life: momguk (pork and brown algae soup), gogiguksu (noodles in pork bone soup), and Jeju sundae (blood sausage with sticky rice stuffing). Momguk looked suspicious at first. I never had “mom,” which is a type of edible brown algae, also known as gulfweed. It actually tasted similar to seaweed. 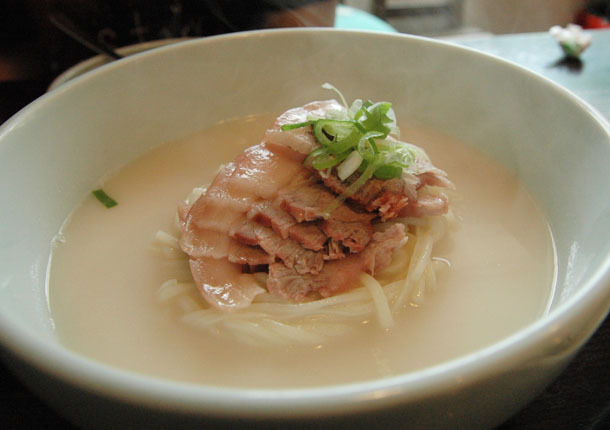 In pork-based broth, “mom” is added for taste and nutrition. 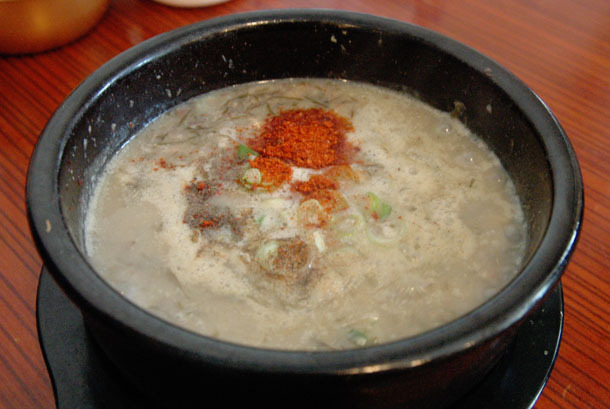 Momguk is chock-full of minerals and dietary fiber it’s considered good for curing hangovers. Buckwheat flour is added for a thick and creamy texture and a sprinkle of chopi pepper (also known as Japanese pepper) contributes to a slightly citrusy note and a refreshing fragrance that goes well with pork. Hearty and fortifying, momguk actually tasted way better than how it looked. Gogiguksu looked less adventurous than momguk. But my friend warned me that some people don’t like it that much because of its bland taste. I liked the subtle taste, but I also understood her concern. The soup was just that—pork bone soup. And the noodles were plain middle-sized wheat noodles. As much as it’s easy to dismiss this dish by saying it’s too simple, I thought it was a good representation of Jeju food—humble, natural, and not ostentatious. Besides, it gets better with a side of good chive kimchi. 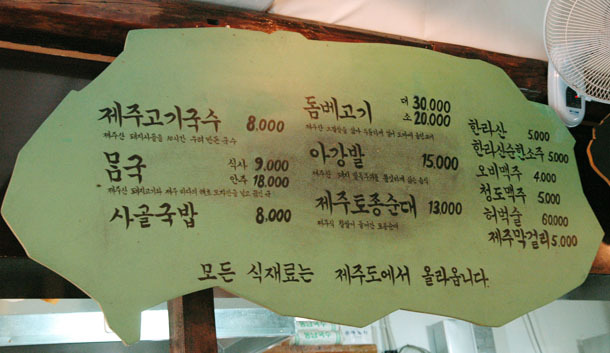 My favorite was Jeju sundae. I’m not a big sundae fan, but tasting Jeju sundae changed my mind about traditional Korean blood sausages. Jeju sundae was soft and chewy, and had a bit of spiciness of chopi pepper. Usually sundaes are stuffed with glass noodles, which make them less soft. I really liked the alternative sticky rice stuffing because it made all the ingredients really “stick” together. And let’s not forget to add a glass of Jeju makgeolli (rice wine) and Hallasan soju to all this. 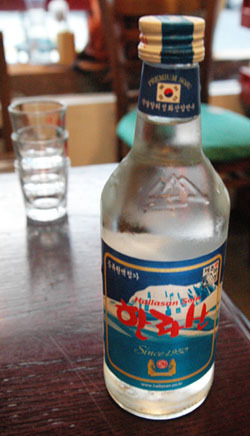 Hallasan (named after the highest mountain in Jeju and South Korea) soju is an old-style soju, which means it’s stronger than your usual. On the other hand, Jeju makgeolli tastes lighter and more refreshing than its mainland counterpart. With the help of alcohol and great food, my friends and I started to feel as if we’ve escaped the megacity and were sitting somewhere in a leisurely beach town. Well maybe not exactly, but something similar to that. This entry was posted in Seoul, Taste and tagged food, island, jeju, pork, Seoul. ← What is Bali Without a Pamper at a Spa?